Do you need more places for laundry detergent storage, or for your other laundry supplies, but don't have room for lots of shelving in your laundry room? If so, this may be just the item for you. 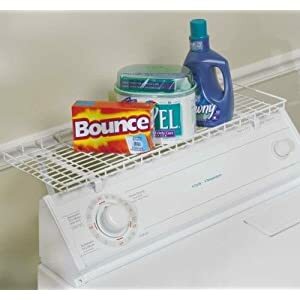 This shelf actually attaches directly to your washer or dryer to allow you to increase your storage space for all types of supplies you need every single time you do a load of laundry, putting those items right at your fingertips. That can be a great use of otherwise wasted space. While this shelving unit does not attach well to every single design of washers and dryers, it is designed to attach well to most standard machines.